Juneau borough residents want to make this area the primary hub for living, leisure, government and business. 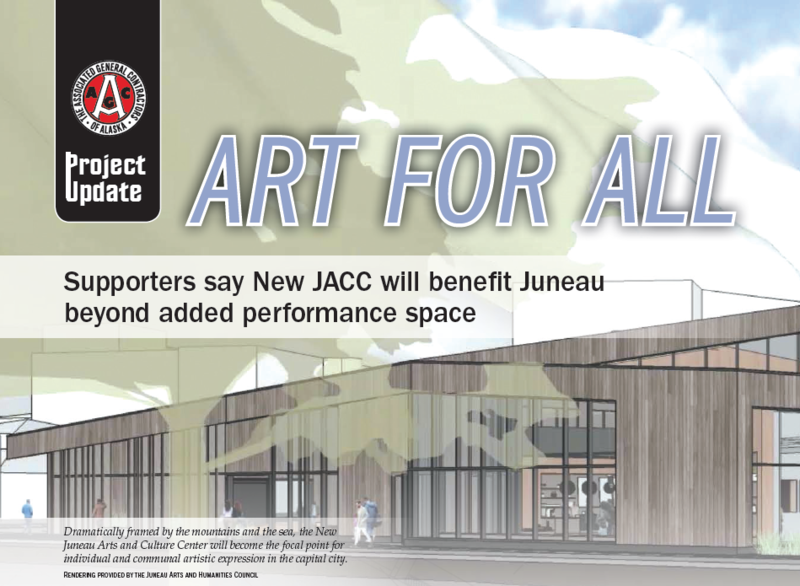 One of the cornerstones in this vision is updating the Juneau Arts and Culture Center (referred to as “the New JACC”) with a new building capable of exhibiting artwork of all forms in addition to a wide range of community events throughout the year. The arts community has outgrown its current facility, the former National Guard Armory built in 1959 and decommissioned in 2005. After years developing a new building plan, the Juneau Arts and Humanities Council, along with a long list of financial supporters, is raising the final funds needed to get construction underway. The Juneau arts and culture scene has seen a steady growth since the 1960s when groups leased a retired church for performances. In 1973, the Juneau Arts and Humanities Council started hosting monthly visual arts exhibits in a small one-room gallery, along with sponsoring programs in venues around town. As more groups formalized, the need for space increased. The city responded by expanding existing facilities within the school district and in 2008 allocated the National Guard Armory as the home base for the Juneau Arts and Humanities Council. In 2012, the Arts Council resurrected a concept for a new center and received a $1 million appropriation from the City and Borough of Juneau for planning, design and construction of the New JACC. Soon afterwards, a 501(c)(3) partnership organization was formed to manage the project. Since then, progress has come in surges. By 2016, several third-party groups had completed a community engagement report and inter- views with top community leaders. 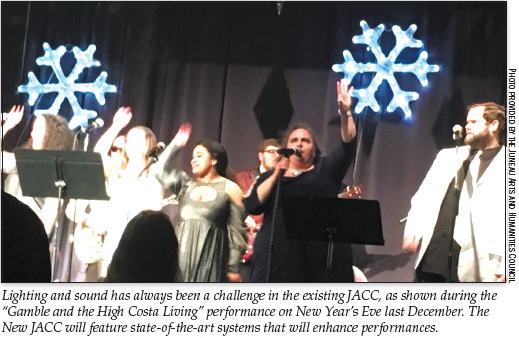 Likewise, the McDowell Group had conducted a Market Demand Study and Feasibility Assessment that verified what the Juneau Arts and Humanities Council, user groups and related partners already knew: The new JACC was a venture that would benefit the entire Juneau community. Unlike the current single-level facility, the New JACC will have two levels, featuring several rooms, performing venues and exhibition spaces. A 300-seat performing arts theater on the first level will be acoustically fine-tuned and have both orchestra and balcony seating with exceptional sightlines. A state-of-the-art technical production system will allow for flexible stage lighting and enhanced sound capabilities. Back­stage will include a control room, dressing rooms, green room, scene shop and sound studio. An addi­tional event studio for smaller perfor­mances will seat 100 people in a black box theater configuration. The first floor also will house an art gallery and community hall in addition to a spacious atrium, patio and sunroom. A majority of the second floor is slated for a sound studio and office and meeting space. In all, the New JACC is 37,000 square feet, a significant increase over the 12,500 square-foot armory. Principal architect Sean Boily of Northwind Architects said there is a real challenge when designing a multi-user complex like the New JACC. Aside from meeting all the functional needs, the aesthetics must find a middle ground between too formal and too casual. To this end, Cornerstone General Contractors has been engaged early in the process to assist. This meant identifying mate­rials such as wood, concrete and simple finishes that make people feel welcome, regardless of their reason for visiting. Having completed the current design features, the project team is now primarily focusing on fund­raising. The total estimated project cost is $26 million. Construction costs are projected to be $19 million with 80 percent of the construction antici­pated to be local hire. So far, over 1,100 people have signed statements of support and approximately 300 public and private donors have contributed to the project, including the City and Borough of Juneau, which contributed $1 million in sales tax money and the land beneath the planned center in the form of a long-term lease. The goal is to have everything in place over the winter, so that Cornerstone’s crews can tear down the armory in March 2019. “The JACC will be a game-changer for the community, and we’re excited to get started,” said Joe Jolley of Cornerstone. Mark Pusich of PDC Engineers agrees. PDC in Juneau (formerly R&M Engineering) assisted with topo­graphic mapping, geotechnical engi­neering and civil engineering design, including analyzing the ground beneath the existing armory. If all goes according to plan, the New JACC will be open to the public in 2021. Cornerstone’s aggressive construction schedule will shorten the amount of time businesses and organizations need to seek alterna­tive venues for their events. 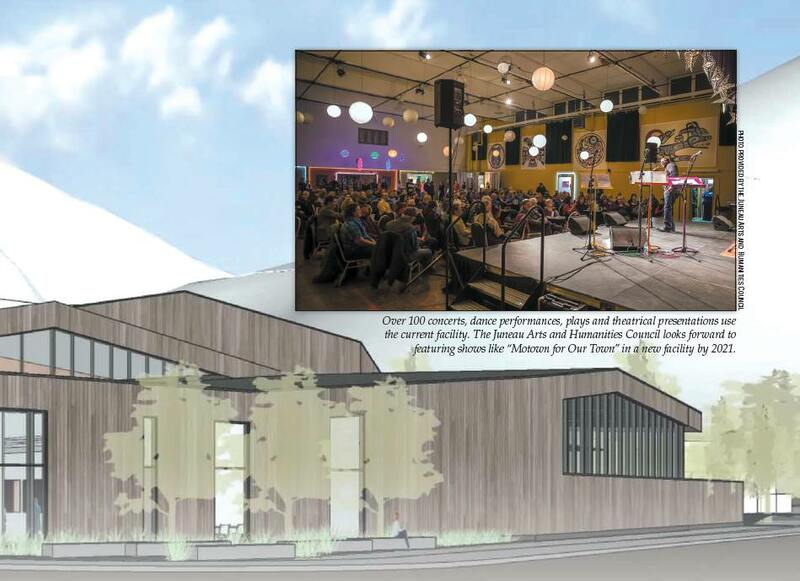 Once completed, the Juneau Arts and Humanities Council will own and operate the new facility. 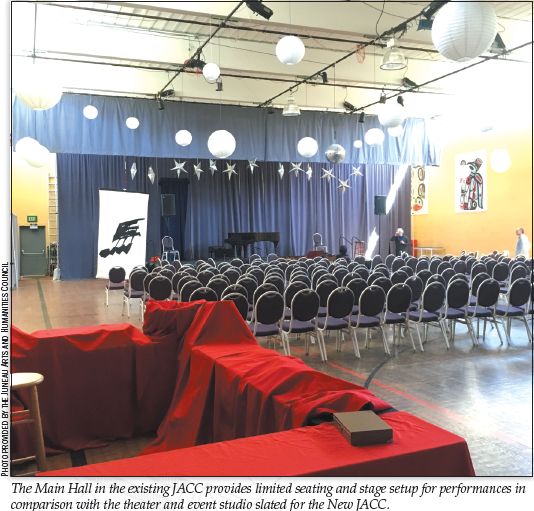 Benjamin Brown, marketing and development director at New JACC, said there is real economic benefit to the community beyond construc­tion and additional jobs associated with the complex. He said a profes­sional venue will encourage visitors to attend local gatherings, conferences and productions, thus increasing hotel stays and spending elsewhere. The New JACC will be adjacent to the Centennial Hall Convention Center and across the street from the APK State Library, Archives & Museum and within walking distance of several notable buildings and attractions. A new structure will help fulfill the revitalization goals of the Willoughby District, potentially increasing the number of families and businesses willing to move into the area.